LUNCHES – Bridges Outreach, Inc.
Bridges delivers more than 65,000 brown bag lunches every year. You can help provide meals by holding a lunch-making party with your friends, neighbors, colleagues or service organization. It’s fun, meaningful and rewarding, and builds camaraderie among friends. 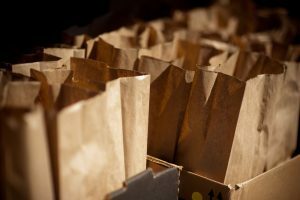 You can either provide fresh brown bag lunches or sustainable brown bag lunches. Sustainable lunches have a longer shelf life. They also give you the flexibility of making the lunches at your convenience and delivering them on any regular donation day. They give us the ability to supplement fresh lunches when we are in need. Sandwich: preferably made with 100% white, whole wheat or soft, whole wheat with low sodium deli meat. Please, no peanut butter and jelly sandwiches. Please do not put mayo, mustard, lettuce or tomato on the sandwich. If possible, include mayo or mustard packets in the bag. Please do NOT put sandwiches in the brown bag lunches – keep separate. Keep sandwiches refrigerated until delivery. Wash hands and use surgical gloves. Approximately one pound of meat makes six to eight sandwiches. Note that loaves of bread vary in size; count the slices! Call a grocery store a day or two ahead to order sliced meat. Warehouse stores are a good place to buy meat, fruit, drinks, and treats. Include mayo and mustard packets, if possible. Wrap sandwiches in zip lock bags. Although not as healthy, fruit cups are an alternative to fresh fruit – please remember spoons and napkins. Pack a meal that can be saved for later without risk of spoiling. This meal contains a tuna or chicken salad package* (not a can of tuna or chicken), fruit cup with spoon, individually packaged goldfish or pretzels, granola bar and water bottle. *tuna or chicken salad packages with crackers can be purchased in advance from Bridges for $1.25 each, or you may find them on your own, although they will likely be more expensive. Sustainable Main Item – available from Bridges for $1.25 per item (chicken or tuna salad with crackers). Please contact the Operations Manager at volunteer@bridgesoutreach.org to arrange purchase of the sustainable chicken or tuna item.